This hat is worked flat using dk baby wool. You can embellish and change this pattern easily. Changing the rib pattern to k2, p2 is also nice, as is knitting in beads as “sprinkles” in the icing section. Using the 3.25mm needles, cast on 60 stitches in colour A. The sample uses a plain brown as colour A. Knit one, purl one to the end of the row. Complete 10 rows. This will create the ribbed bottom of the hat. Change to the 4.5mm needles. Using colour B knit a row on the new needles. This makes the icing. The following rows (in pink in the sample) are all numbered from after the ribbed piece. 1: k1 front, yarn around needle, k1 back in every stitch on this row. Row 17: Continuing with colour B, knit 3 stitches, knit 2 together. Repeat until the end of the row. Row 18: Purl the row. Row 19: Knit 2 stitches, knit 2 together. Repeat until the end of the row. Row 20: Purl the row. Row 21: Knit 1 stitch, knit 2 together. Repeat until the end of the row. Row 22: Purl the row. Row 23: Knit 2 together. Repeat until the end of the row. Row 24: Purl the row. Row 25: Knit 2 together. Repeat until the end of the row. Cut the yarn with 30cm remaining. Slip all the stitches onto the yarn, and pull tight. With a little stuffing, the size of a small walnut, stitch up the sides of the red cherry, and stuff. Wind the yarn around the base of the cherry, tightly shaping into a sphere. Stitch up the side of the hat in matching yarn. What size is this hat supposed to fit? 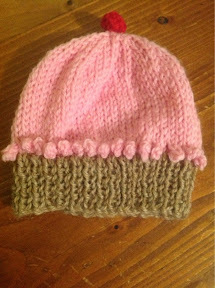 I’m looking for a cupcake beanie that fits 2-3 year olds. This is the pattern you are after then… the fit is for a toddler/small child. Thank you, good to know. It was a pattern written so long ago that it probably needs revisiting.